You know it’s not the growing season when you go to the farmer’s market and are thrilled (yes, thrilled, I’m not exaggerating) to find local cabbage. I snatched up a nice head of it and will share a recipe later this week. Seeing that lovely green ball of cabbage filled me with anticipation for April through September when so many fruits and vegetables will be available, right here in my part of the world. The cabbage also made me think of another part of the world, Italy. I’ll explain. A few years back, probably around 2005, I read the book Under the Tuscan Sun by Frances Mayes (I always make sure to tell people that the book is nothing like the Diane Lane movie of the same name). This beautifully written memoir about Frances’ endeavor to buy and restore an old house in Tuscany blew my mind. I hate to admit it, but before reading this book I had no concept of eating seasonally. If I wanted to serve roasted asparagus with Christmas dinner, I would buy it at the grocery store. I didn’t think much about where it came from; I wanted it so I bought it. On the other hand, Frances describes walking into town and seeing what’s for sale, and that’s how she plans dinner. If it’s mushroom season, she eats mushrooms. If it’s asparagus season, she eats asparagus. If it’s tomato season, she eats all things tomato—a completely new idea to me. 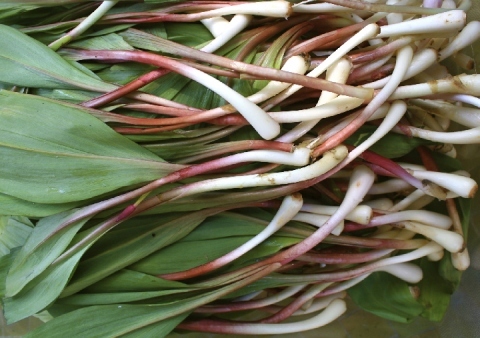 Frances even forages for ramps around her property (which grow wild in early spring and taste kind of like leeks, but sweeter). Foraging for ramps reminded me of times in the summer when I foraged for wild blackberries when visiting a friend’s lake cabin. To avoid the inevitability of being stuck by a thousand brambles, I donned jeans and a long sleeved shirt in the middle of a July heat wave. The blackberry pancakes alone were worth it. Seeing that head of cabbage reminded me of Tuscany and in-season blackberries, and gave me hope for the upcoming bounty of fruits and vegetables. That’s why I’ve started the countdown you see on the right. I am counting down the days until June 4 because this is the day I will go all the way. I am going to eat all local foods, all the time. The date of June 4 is a convenient day for me because it coincides with the beginning of my CSA. I will also have time to do some research and plan a local-food-eating-strategy of sorts (documenting it here, naturally). So until then, I’m going to drink some Argentinian wine and eat ridiculous amounts of Dubliner cheese (my favorite!). I’m betting, though, that I can find great replacements for some of my favorite things right here in my local area. Brandywine Valley Wine Trail here I come! You are one of the few people that I’ve heard say Under the Tuscan Sun was a good book but not a good film. I agree completely. I had totally forgotten the part about the ramps – have to admit that I’ve never seen or tasted them. Well, when the only thing similar about the movie and the book is the setting, it’s hard for me to like the movie! I wonder how Frances Mayes felt about it. Mycopy of Under the Tuscan Sun is marked and underlined and worn. It’s one of my favorites. I’ve had ramps at a restaurant before but haven’t made them myself. Delicate and oniony.